Each model has its specific characteristics, depending on the shape of a guitar, bracing pattern, used material and structural design. Each model can be modified but significant qualities are unchangeable. 15" - The smallest true jazz guitar model. 15" models can be used with guitar effect. 16" The universal model for classic bebop, but great for funky, fusion or other modern jazz styles. Double Cutaway (DC) Double cutaway is instrument mostly designed with central block. Block material is determinantal for sound of the guitar. Double Cutaway construction makes the guitar versatile. Model can be made like jazz or like rock guitar depending on used materials. Available in Historic or Bebop version. Full strong tones with sufficient sustain. 18" The largest standard model, mostly made in Historic version. Steel Thin Atypical model in electric guitar size. Grand Concert Small 15" model designed for on stage playing. Grand Stage Middle sized model with surprisingly coloured sound and acoustic power. Jumbo Stage Enlarged Grand Stage model. 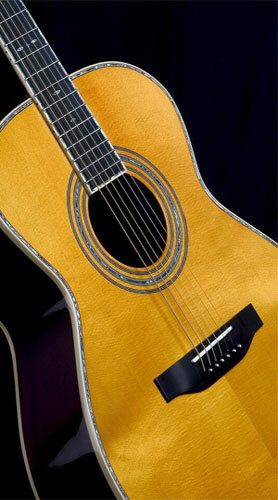 Dreadnought The most versatile model of acoustic guitar. Jumbo Jumbo guitars have coloured, a little bit mellow sound. Super Jumbo The legendary acoustic guitar model. Nylon strings have lower tension than steel strings and that means lower acoustic power. This is why the highest quality materials and delicate construction are necessary to achieving optimal sound qualities. Nylon string guitars are mostly full solid. Nyloncaster, Nylon Electric, Semi and Jazz lines are departure from the rule. These guitars are determined to onstage playing with pickup systems. Smaller model inspired by standard classical guitars. Sound hole absence makes the guitar absolutely resistant to feedback. Spanish - model is designed for classical music players. Coloured sophisticated and laud sound. Flamenco - classic guitar designed especially for percussive flamenco style. The typical material combination is Spruce for top and Cypress for body. Less coloured and compact sound. Jazz - nylon string guitar, mostly with cutaway, designed for onstage playing. There is a different construction applied to avoid feddback and respect used pickup systems. Another distinction can be applied to neck construction. Nut width 46 - 48 mm, round fingerboard with 21 - 24 frets, 14 frets to the body are options on demand. The acoustic sound isn´t so loud and coloured but it is optimized for pickup usage. Semi - thin side guitar designed for onstage playing with pickup systems.